Courtney Evans takes a sip of her Passion Tea and places the cup back on the circular wooden table. Her tearful brown eyes search to fixate on anything as distraction from the topic at hand. The smell of fresh coffee beans envelopes the Starbuck’s adjacent to the Howard University Bookstore as customers stalk around the room, anxious to get their order and begin their morning. Sitting in a dim corner with chilling calm amid the madness are Courtney and her twin sister, Taylor, both juniors at Howard. It has been a year since Alexis Simpson, their high school friend, was charged in the death of an 18-year-old student at Bowie State University. The twins and others close to Simpson are still trying to cope with the ordeal. What exactly happened that night? This was certainly not the Alexis they knew and loved. Simpson was charged with first-degree murder after allegedly stabbing her roommate, Dominique Frazier, in her throat on Thursday, Sept. 15, 2011. Within hours of the fatal stabbing, social networks such as Twitter and Facebook were buzzing with news about the incident. It wasn’t long before Howard students, too, knew what had happened at Bowie State in suburban Maryland. Students in the Washington area have had mixed emotions. Some were mad, and others, simply confused. However, for Courtney and Taylor Evans, the situation hit close to home, and they have been in disbelief. 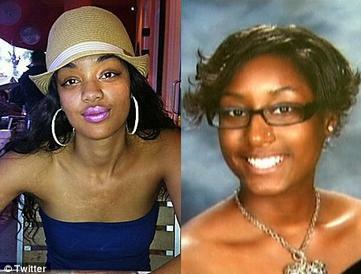 Alexis Simpson, left, face trial this fall in the stabbing death of Dominique Frazier at Bowie State University..
A year later, many are still baffled. What truly went on in that dorm room? Was it an act of self-defense or pure anger gone wrong? As those close to Simpson await her trial on Nov. 14, they try to make sense of it all. Many of Simpson’s supporters want people to remember that she is human and not see a murdering monster as she has been portrayed. They want everyone to know the Alexis Simpson they remember. Alexis the teenager. Alexis the student. Alexis the young woman who is not without faults, but whose life still shines brightly. Simpson’s friends are relieved to know that for the time being she is in the comfort of her home in District Heights, Md., where she is reportedly confined without visitors as a condition of her release.